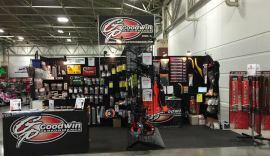 Snowmobile USA Show | Goodwin Performance, Inc. – Snowmobiles, Snowcross, High Performance Clutches, Suspension, Service, and More! We will be attending the Snowmobile USA Show at Wisconsin State Fair Park on Friday Oct 14- Sun Oct 16. Stop by our booth #116 and pick up the items to get your sled ready for this upcoming snow season. 25% off Stud Boy Traction products, Sales on C&A Pro Skis, 15% off Goodwin Clutch Kits and much more!